← Is poetry dead? or can poetry matter? 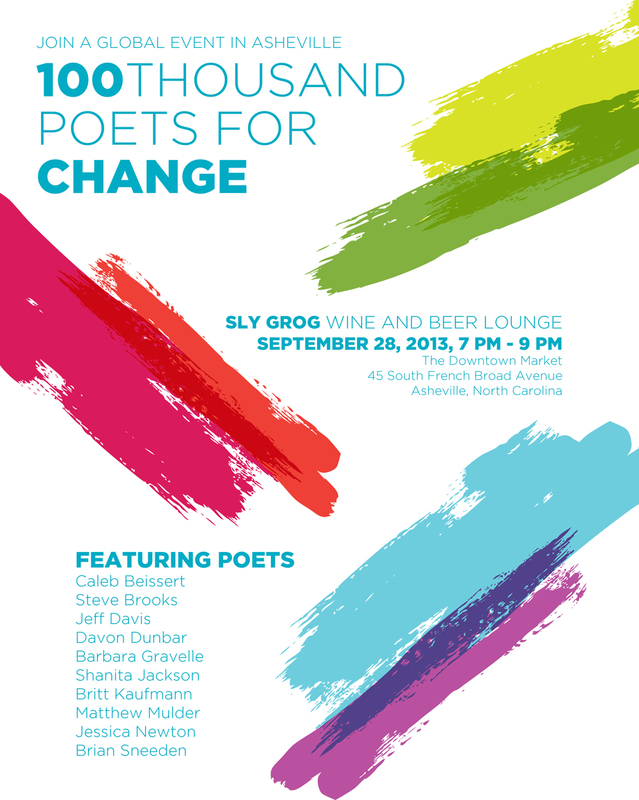 Tomorrow night, Asheville’s 100 Thousand Poets for Change event invade Sly Grog Wine and Beer Lounge (The Downtown Market, 45 South French Broad Avenue, Asheville, North Carolina). The Asheville event will be held Saturday night, September 28, 2013, from 7 PM – 9 PM. Featured poets and their bios are listed below. Please note: after the featured poets read, there will be time for you to read you poem. Bring your poem and join 100 Thousand Poets for Change in Asheville, NC. Caleb Beissert is a poet, translator, and musician from Washington, D.C., living in Asheville, NC. His work has appeared in numerous literary journals, and his book Beautiful: Translations from the Spanish was published by New Native Press in 2013. Beissert hosts an open mic at Vanuatu Kava Bar and produces the monthly reading series “Poetry at the Altamont” in Asheville. Steve Brooks a poet and author of Philip Blanc in San Francisco (Panjandrum Press, 1972), The Dancer in the Heart (Philos Press, 2001) and his latest collection of poems, Essential Occupation. He currently resides in Asheville, North Carolina. Jeff Davis is a poet, host of the radio show “Word Play” (now on AshevilleFM.org) and author of Transits of Venus (2005) and Natures: Selected Poems, 1972 – 2005 (2006). He serves as director of MadHat, Inc., teaches in UNCA’s Great Smokies Writing Program and co-hosts the monthly “Poetry at the Altamont” reading series in Asheville. Davon Dunbar,14 , was a member of the winning Asheville Wordslam Middleschool team two years running and is now a freshman at SILSA, a member of the spoken word poetry club, and local poetry slam competitor. Barbara Gravelle, author of several poetry books including, Keepsake, Dancing the Naked Dance of Love, and her latest collection of poems, Poet on the Roof of the World. 16-year-old Shanita Jackson lives in Hendersonville and attends Blue Ridge Early College. She is a two-time member of Asheville’s Brave New Voices team, has won too many youth poetry slams to list here, and is a co founder of Soulspeaker, a youth-centered and youth-driven local organization devoted to youth spoken word poetry. Britt Kaufmann lives in Burnsville with her husband and three children. She has written one chapbook of poetry Belonging and two plays: An Uncivil Union: the Battle of Burnsville and Between the Tackles. 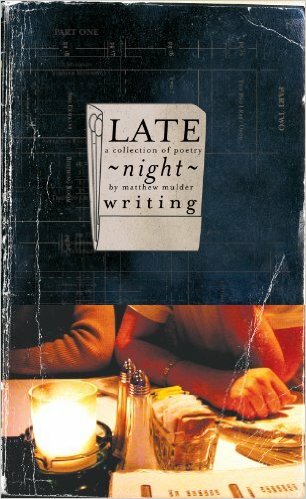 Matthew Mulder is a graphic designer and poet living in Asheville. His poetry and prose have appeared or are forthcoming in Crab Creek Review, Small Press Review, The Indie, H_NGM_N, and other publications. Jessica Newton’s poems have been published in Appalacian Literary Review, Stolen Island Review and Colere. She sees poetry as an engine that’s fueled by change on an individual level. A WNC native and graduate of UNC-Asheville, she lives in Candler. Brian Sneeden has produced, designed or written for more than a hundred theatrical performances. His poems and reviews have appeared or are forthcoming in a variety of journals, including Beloit Poetry Journal, Ninth Letter, Third Coast, Asheville Poetry Review and other publications. He is the current Poetry Editor at Meridian. Use the hashtag #100tpcAVL when sharing details about Asheville’s 100 Thousand Poets for Change event.